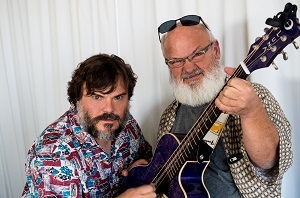 Kyle Gass and Jack Black have been together making music for over two decades now as Tenacious D. Jack's become incredibly famous as an actor, and he keeps busy – he's got two movies out this month alone. Despite this, Tenacious D is a project Jack and Kyle love to revisit. They're releasing their first album in six years, and putting together an animated series pretty much all on their own. They voiced all the characters in the series, and Jack was also responsible for the illustrations of the series. Safe to say their going back to their DIY roots! They've gone from playing tiny clubs in Hollywood to selling out 85,000 seat stadiums – granted they were opening for Metallica – but still! The first episode for the new animated series, "Post- Apocalypto" just dropped on Youtube – with new episodes every Friday until November 2nd. In the series, Jack and Kyle survived the apocalypse, and the world is very weird now. There are monsters everywhere and Tenacious D is on the mission to change planet earth back to the way it was before. It's silly, it's dumb, and it's really, really funny. This week, we'll talk with The D about this exciting new chapter in their music careers. We'll dive deep into their long lasting friendship, get the scoop on how the group formed, and they'll perform a snippet from an unreleased song. Plus, find out what was Jack Black's first paid gig. The answer might surprise you. To mark the release of the "Post-Apocalypto" album they're also kicking off a huge tour all over North America – check out the tour dates here. 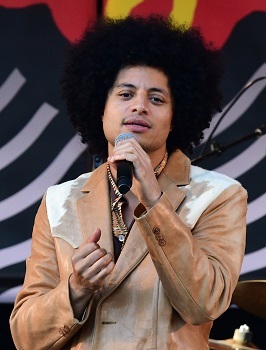 José James is a singer from Minneapolis. He works a lot in jazz - collaborating with folks like Chico Hamilton and Kris Bowers. But his collaborators go beyond jazz – into hip-hop, electronic, and soul music, too. He'll tell us about "Love and Happiness" by Al Green. José's introduction to Al Green was through the "Pulp Fiction" soundtrack. Soon after listening to "Let's Stay Together," he fell in love with Al Green's music. But it wasn't until he heard "Love and Happiness" that something really clicked. He'll tell us how the song changed how he listened to soul music, and how it influenced how he makes music. hitting the road this fall. Instead of The Outshot this week we're doing something a little different. It's a standup routine from the comedian Ted Alexandro. It was recorded a few weeks ago at the Comedy Cellar, in front of the same brick wall that Louis CK stood in front of when he returned to the standup stage. He talks about CK and Bill Cosby, who was recently sentenced to prison for sexual assault. A quick warning: Ted talks frankly here about sexual assault and abuse – there isn't anything too graphic, but if those subjects are sensitive to you or inappropriate for anyone you're listening with please keep that in mind.